Every once in a while, I show off some of the crazy stuff that’s cluttering up my workshop. Today, you get to see some of the weird and wonderful hardware-hacking gear the mailman dropped off last week. The best part of being a prototype designer is the toys. Whether they’re materials for an upcoming project, samples from suppliers and developers, or plain old impulse buys, I get some really crazy stuff in the post. Everything you see above was dropped off last week, mostly from an Adafruit order. Let’s dive in! A: Adafruit INA219 Current Sensor Breakouts – These are for an upcoming USB-related side project, and the reason I went to Adafruit in the first place. Everything else from Adafruit is a total impulse buy. I’m not usually the consumer type, but Adafruit has started stocking some seriously crazy stuff! The chips on these breakouts are high-quality high-side current sensors, and are a real pleasure to use. They have a very tolerant voltage and current range, 5V and 3V3 logic levels, and built-in ADC. They use I2C, so I can run all five off the same I2C bus. While the INA219 has 16 selectable I2C addresses, Adafruit’s breakout only allows you to select from four. To connect the fifth, I removed one of the address-select resistors and jumped its address-select pin to SDA. B: AT&T GoPhone SIM – I’ve had a few 3G modules sitting around, and I’m building an M2M project for a client, so why not get cellular with it? Of all the providers I checked, AT&T seems the most hobbyist-friendly. You buy the SIM for $10, and it’s true pay-as-you-go, 1¢ for 5KB of data or 20¢ per text. The data might seem overpriced, but unless you’re transmitting media, 5,000 bytes goes a very long way. I haven’t activated this yet, so it may not work with my 3G modems. C: 5V 10A Power Brick – Another Adafruit product, to power the USB project. I hope I don’t end up using the full 50W. It’ll burn the traces off my protoboards. D: Google Glass Flashlight – Deqing Sun’s USB accessory adds a flashlight to Glass! Unlike my half-assed version, Deqing’s flashlight can be turned on and off with a voice-triggered Glassware using Android’s USB Host API. I don’t like this version as much as the preproduction unit he gave me a few months ago – the LED is too diffused and inefficient to be a usable headlight. I’ll probably desolder the LED and use it for a voice-controlled hack like the Locutus Laser I built for Instructables. E: Adafruit Perma-Proto – A custom perfboard with the islands connected like a breadboard, complete with bus lines and mounting holes. The idea is that a beginner can carbon-copy her breadboarded project directly onto the perfboard, without having to bridge islands or whatnot. It’s very well-made, with milled edges and three colors of silkscreen. I’m a big fan of Veroboard, so these are stacking up in my boards drawer. They throw one in for free when you buy $100 worth of stuff like me. Maybe I’ll use it to break out a DIP, or make a Boarduino-type thing? F: Raspberry Pi Camera Cables – More Adafruit products, these let you mount a Raspberry Pi camera a few feet away from the Pi itself. These are going into a joke project that pokes fun at people’s reactions to the Google Glass camera. G: Raspberry Pi NoIR Camera – An interesting product and a brilliant pun. This is the Raspberry Pi camera, except without an IR filter. It’s useful for night-vision projects, eye tracking, doing weird things with flowers, building questionable X-ray glasses, and spotting security cameras. I use infrared in many projects, and I’ll probably use this to make sure they’re working properly. I: Nuts and Volts Magazine – An outdated medium full of outdated projects using outdated parts. I can’t believe this magazine is still being printed and has active contributors. My grandpa recognized the title. I’ll gladly support it until the day it dies. There you go, some of the stuff I received in the mail last week. Tune in next time, when I go over the wearable technology I actually wear. 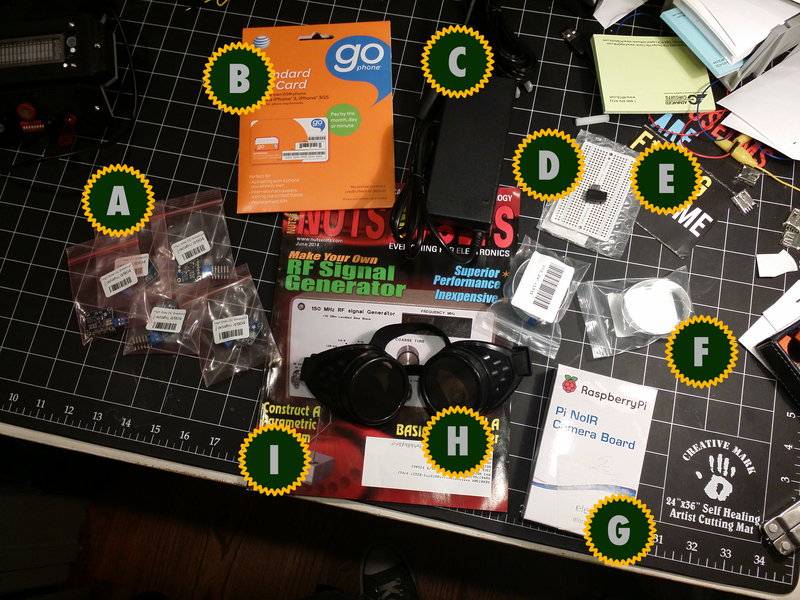 This entry was posted in Hardware Hacking, Swag by Yours Truly. Bookmark the permalink.